What is the best way to learn about parts of Canada’s North, its people and the environmental issues they face? You pack your bags and your equipment and head out for an on-the-ground research course. That’s exactly what a group of students in Wilfrid Laurier University’s Department of Geography and Environmental Studies’ fourth-year field course GG451 did earlier in the term. 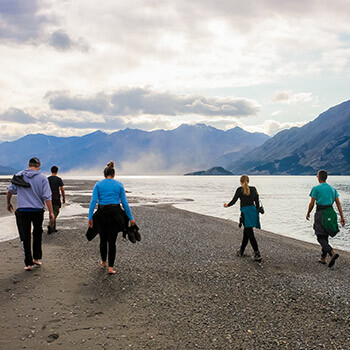 Led by Laurier professors Scott Slocombe and Mary-Louise Byrne, the group spent 10 days immersed in the cultural and natural landscapes of the Yukon honing their field research skills. The course, which builds on a third-year field camp, gives students the unique opportunity to conduct research in an environment they would not normally have access to. Slocombe has led the course in various locations across Canada, the Caribbean, and Europe, but is partial to the rich learning opportunities the Yukon provides. The group divided its time between Whitehorse, the Kluane Lake Research Station near Kluane National Park and Reserve, and Dawson City. Students worked in small teams to conduct research on topics relevant to the Kluane region and its communities. Two teams worked with drone technology to map the spread of the spruce beetle outbreak at a local scale, as well as to gather aerial footage of declining water levels of Kluane Lake. Another group explored clean and alternative energy sources that could power remote communities that run on diesel-fuelled generators, while a fourth explored tourism development in the Yukon and the associated challenges and opportunities. Fourth-year student Leyla Mains, who had never been west of Ontario before, saw the field course as a golden opportunity to connect real-world research with her plans post graduation. “I’m interested in a career in urban planning, so conducting research on tourism and the opportunities and challenges associated with it is relevant and intriguing for me,” says Mains. The experiential learning opportunity would allow Mains to strengthen her ability to conduct interviews, analyze data and write professional reports – impressive skills to highlight on a resume. Mains’ group focused their research on tourism development around Kluane National Park and Reserve. The park is a UNESCO World Heritage Site and one of the largest internationally protected areas on earth. It offers domestic and international visitors picture-perfect landscapes filled with rugged mountains, endless ice fields and northern wildlife. Current tourist activities include flightseeing (tours in small airplanes), hiking trails, driving routes and some snowmobile access. The government and local Indigenous groups have also discussed developing an eco-resort in a remote area of the park. Mains’ group conducted observational research and held in-person interviews with Yukon Tourism, a tour operator, and a private consultant. The group also heard talks from conservation groups and government officials. Back at Laurier’s Waterloo campus, Mains’ group compared the region’s past tourism strategy against the current one. They presented their findings in a poster project mid-November with a common theme emerging. Mains’ group will share a copy of its research report with the stakeholders they interviewed. Posters from each student research group will also be on display in the E-wing of Laurier’s Arts Building in early December. Learn more about research opportunities and field courses offered through the Department of Geography and Environmental Studies. What sets Laurier's science programs apart? Watch the innovative education video to hear why our students are proud to be Golden Hawks.